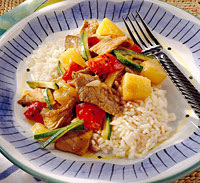 This tangy, sweet dish featuring a colorful mix of pineapple and vegetables can be made with your choice of pork, lamb, or beef. Trim fat from pork, lamb, or beef. Partially freeze meat. Thinly slice across grain into bite-size strips. In a medium bowl stir together meat, vinegar, soy sauce, brown sugar, dry mustard, ginger, and pepper. Let stand for 15 minutes. Drain meat, reserving marinade. Set aside. Drain pineapple, reserving juice. For sauce, in a small bowl stir together reserved pineapple juice, reserved marinade, and cornstarch. Set aside. Pour cooking oil into a wok or large skillet. (Add more oil as necessary during cooking.) Preheat over medium-high heat. Stir-fry onion in hot oil for 2 minutes. Add zucchini and sweet pepper; stir-fry about 1-1/2 minutes more or until vegetables are crisp-tender. Remove vegetables from the wok. Add meat mixture to the hot wok. Stir-fry for 2 to 3 minutes or until thoroughly cooked. Push meat from the center of the wok. Stir sauce. Add sauce to the center of the wok. Cook and stir until thickened and bubbly. Return cooked vegetables to the wok. Add pineapple. Stir all ingredients together to coat with sauce. Cook and stir for 1 to 2 minutes more or until heated through. Serve immediately over hot cooked rice. Makes 4 servings. Prepare vegetables; cover and chill up to 4 hours. Calories 317, Total Fat 10 g, Saturated Fat 2 g, Cholesterol 38 mg, Sodium 806 mg, Carbohydrate 42 g, Protein 16 g.
This entry was posted on 12:10 AM and is filed under Low Sodium . You can follow any responses to this entry through the RSS 2.0 feed. You can leave a response, or trackback from your own site.